InicioCould A Novel Toothbrush Topper Knock Out Bad Breath? You’re so used to that minty, fresh taste of toothpaste kick-starting you awake every morning that you just can’t dream of doing away with it. Well, you don’t have to… just make sure you brush with something else added to your toothbrush, and you might find you’ve kissed bad breath goodbye! Would you believe that something as simple as salt and pepper on your brush goes a long way in preventing and checking bad breath? The combination gets rid of bacteria build-up in the mouth and promises you cleaner, fresher breath. So get those pepper and salt shakers off your dining table and into your bathrooms. And how does this unlikely pair prevent bad breath? Pepper is a strong anti-bacterial agent. Salt too, for that matter. In addition, salt helps tighten the gums around the base of the teeth, which discourages gum disease, a problem that typically starts when food particles get trapped in these crevices and start putrefying. Put salt and pepper together and you have a winning combo for your teeth! So shake them on and brush away bad breath. The director of the Environmental Dental Association has an even better solution – equal measures of salt and baking soda. 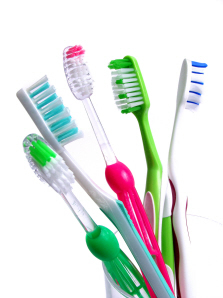 Wash out your toothbrush with a 1:1 solution of peroxide and water, dip it into the powder and brush away. You might grimace at the taste, but you’ll smile when you smell your breath. What also makes a huge difference to some peoples’ bad breath — and can even make it disappear — is to clean your tongue every day, maybe twice a day. Research on oral hygiene has identified a coated tongue as one of the key areas that contribute to bad breath. So get yourself a good tongue cleaner – no, don’t use your toothbrush – and get to work. When using one, be sure to clean from the inside out, from the throat area toward the lips. Bring it down firmly without pressing the flesh too hard (a good tongue cleaner will help prevent the gag effect). What your cleaner or scraper should do is remove the gooey stuff accumulated on the tongue without irritation or harm. For many people, a copper tongue cleaner works best. It’s firm and doesn’t rust. And it soon gets rid of days of bad eating and drinking and the resulting deposits on your tongue. Who would have ever thought a clean tongue would be so important? Well, try it and see. Pay attention to the part at the very back, where the greatest number of odor-causing bacteria is found. If your bad breath stems from all that stuff on your tongue, it’s very possible to get rid of it! What also helps many people is mouthwash, as long as you don’t make the mistake of buying the kind with alcohol, which can worsen bad breath. You could make an herbal, all-natural mouthwash at home with a cup of water and a drop of peppermint oil. Or, try water in which mint leaves have been steeped for 10 minutes. Or use a light infusion of green tea, which has been shown to have a potent effect on bad breath. So remember your brush-teeth, scrape-tongue routine and you’re on the right track to fresher breath. Just remember, when you brush your teeth, use a soft toothbrush and angle it slightly when you brush the area between the teeth and the gums. Push the toothbrush upwards to get rid of any food particles trapped there. Even better, use a powerful oral irrigator, and don’t forget to floss, because any food trapped between your teeth is bound to putrefy — not the effect you were going for. Too simple? But who says bad breath is always complicated? Granted, sometimes the causes run much deeper. But for many people, all it takes are a few extra nods toward hygiene, and you’re all set to smell like a rose every time you open your mouth!